In a large mixing bowl, cream together the room temperature butter and brown sugar. Add in the eggs one at a time, and beat well after each addition. Mix in pumpkin puree, vanilla, and milk, and mix well. In a separate bowl, whisk together flour, baking powder, baking soda, cinnamon, allspice, and salt. Gradually add the dry ingredients to the wet, and mix until just barely combined. Use a spatula to scrape down the sides. Heat your waffle iron, and cook according to your waffle maker instructions. Whisk eggs, canned pumpkin, vanilla, and maple syrup together. Add spices and baking soda. Melt the butter and add to the batter. Grease skillet with butter and spoon out batter into small pancakes. Flip carefully. Combine all ingredients in a large mixing bowl and blend well. Coat muffin tin with non-stick cooking spray (or use paper liners) and divide batter among six cups. Bake for 32-35 minutes or until muffins are cooked all the way through. I went on a cruise and had this soup. It was SOOO good! 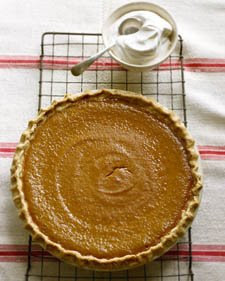 The pumpkin flavor isn’t overwhelming, the taste of the chicken stock and other spices really makes it taste good. Roast onions, leeks and garlic cloves in olive oil in a preheated oven at 300 degrees Farenheit for 30 to 45 minutes. Remove and puree in blender. Bring stock, pumpkin puree, pureed vegetables and chicken base to boil. Simmer for 45 minutes. Add Half & Half and simmer. This recipe serves 15 people. 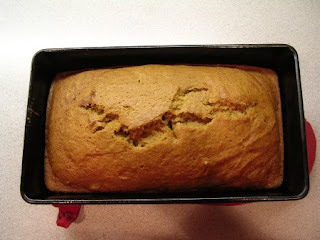 I wanted to make pumpkin bread the other day and I didn’t have any shortening so I went to allrecipes.com and found a pumpkin bread recipe that didn’t call for shortening and it turned out to be soooo good! I think I like this better than my recipe. I followed the recipe exactly except I didn’t have any ginger or nutmeg so I left that out and it was really good without it. Mix shortening, sugar, eggs, pumpkin, and water. In separate bowl mix remaining ingredients. Add together. Cook in 2 loaf pans at 350 degrees for 1 hour.